Some say the age of the personal style blogger is over. Today, the girl needs more than an outfit, a boyfriend, and a camera. Bloggers need to think about production quality, editorial strategy, and affiliate programs to really gain a foothold on the web. They are more like editors, creating publications worthy of a million-person audience than a few thousand super-fans. Yet it still comes down to that camera. Nine times out of 10, the bloggers who move merchandise, who get people talking, who attract repeat advertisers, love to strike a pose. So we say the personal style blogger isn&apos;t going anywhere—-in fact, she&apos;s more powerful than ever. To ensure the numbers we crunched were accurate, we worked with individual bloggers, affiliate marketers and Fohr Card, the new database for brands to access legit stats and information on thousands of bloggers. We also took into consideration audience feedback about 2010&apos;s list. You&apos;ll notice that this group is tighter—any site arguably more about lifestyle than fashion or beauty was eliminated. Like any list you read on the internet, our ranking is up for debate. And we encourage it! Let us know what you think. And feel free to Tweet me if you have any more questions about the methodology. Now, go ahead, scroll through to see who made it. With around 2 million 3.7 million pageviews a month, a booming affiliate marketing business and more sponsorships and brand collaborations than pretty much any blogger out there, 24-year-old Leandra Medine dominates the space. And with good reason. Her Anna Dello Russo-meets-Nora Ephron take on fashion blogging is still as fresh as it was when she launched in 2010. Her next challenge? Adding more voices to the site without detracting from her own. People love to hate on Bryan Boy, who hails from the Philippines but calls New York City home. Probably because they&apos;re jealous of his 328,000+ Twitter followers, his cozy deal with CAA, and his gig as a judge on America&apos;s Next Top Model. What the haters fail to see is that his success is unprecedented: He was the first to make a real living out of fashion blogging. And he&apos;s arguably still doing it best. A mix of DIY, food, and most prominently, fashion, LA-based Emily Schuman&apos;s sincere and friendly approach to fashion blogging has made her the idol of women across the country. Last year, Schuman—-who is repped by Say Media (the same company that sells ads for Fashionista)-—signed a deal with Estee Lauder. She also published her first book in August 2012, which some loyal fans found to be too similar to the content on the blog. (Although she undoubtedly gained thousands of new followers through its promotion.) The site, founded in 2008, also does a bang-up affiliate marketing business. Eadie, a former buyer at Gap and Old Navy who relocated to New York last year (to work as a merchandising manager at Tory Burch), doesn&apos;t bother with bells and whistles. Her wildly popular blog, which garners 1.8 million pageviews a month, is straight-up outfit posts showcasing her East-Coast-preppy-meets-California-boho style. So it&apos;s no surprise Eadie is popular with affiliate marketers. With more than two million pageviews a month, brands love working with Los Angeles-based blogger Aimee Song. She&apos;s worked with Italian high-fashion boutique Luisa Via Roma, Schutz shoes and most recently starred in Botkier&apos;s spring advertising campaign. Another oldie-but-goodie, if you can really say that about a 21-year-old. The endlessly fascinating Aldridge—who launched her blog in 2007 at age 15—continues to buck blogger trends, living with her parents in Dallas and staying far away from the thrills of fashion week. Yet her site, which attracts over one million pageviews a month, is still a favorite amongst industry insiders, mostly because she has great taste and adores fashion. Even a scathing Texas Monthly article, which pawned her off as a helium-headed mean girl, couldn&apos;t get her down. "There is too much negativity out there," she said in rebuttal on her website. "You can portray me as frivolous all day long but I’ll take frivolous over nasty any day." Want to learn 25 ways to ties a scarf? Nguyen can show you. Her YouTube video, launched in April 2011, has garnered over a million pageviews. The blogger currently has over 300,000 YouTube subscribers, who live for her easy-breezy tutorials. The former accessories designer launched her blog in 2008, quickly rising up the ranks thanks to expert styling and movie star looks. Today, she and friend Jamie Beck (of the blog From Me to You) work on plenty of projects together, with Framel styling and Beck taking photographs. When Bag Snob launched in 2005, "our dream was to one day buy Kelly a Birkin," says Craig. "Little did we know we&apos;d be able to make enough to buy her one within six months thanks to affiliate income." Today, Bag Snob is known within the industry as a site whose recommendation counts: If Cook and Craig endorse a bag, it sells well. Affiliate income is the main bulk of their business, unlike most of the other sites mentioned, which still rely heavily on banner ads and brand partnerships. (Although Snob Media does plenty of that stuff, too.) Another differentiator: While they do use affiliate marketing programs like ShopStyle and RewardStyle, most of their referral commissions are negotiated brand-by-brand. In the coming months, Craig and Cook will roll their secondary sites—including Beauty Snob, Tot Snob, Shoe Snob and Couture Snob—into Snobessentials.com. Bag Snob will remain independent, although some of its content will be syndicated on Snob Essentials. "We just think it will feel more organic," says Craig. "It&apos;ll be easier to run the two sites instead of six—-we would like to spend more time with our kids." Australian blogger Stein has a pretty incredible life: She&apos;s constantly traveling the globe, wears a mix of pristine vintage and high-end designer pieces, and comes off as awfully nice in her posts. All of which has awarded her a fast following. The site garners around 700,000 pageviews a month. Sometimes, the business is in the blog. Other times, the blog is simply a platform to showcase another talent. Sources say that Beck, a photographer whose clients include Of a Kind and Lincoln cars, often charges five figures for her cinemagraphs (highly stylized gifs created with her husband Kevin Burg). Along with Le Fashion, her cool-girl-guide to style, Camp also contributes to Who What Wear and runs the wildly popular celebrity style blog Olsens Anonymous. Fashionista's compiled a list of the most influential personal style bloggers right now. Native Advertising and Style Bloggers: Is the Party Over? 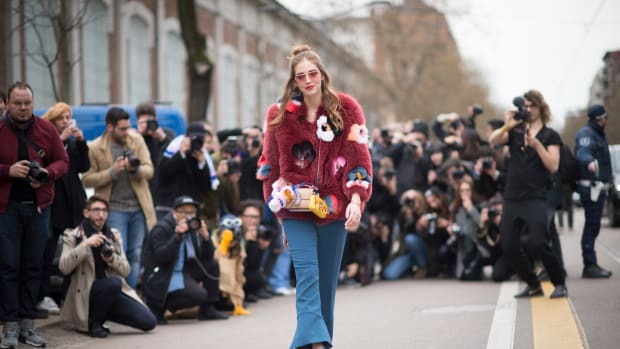 Fashion brands and their favorite bloggers have been playing with native advertising for years, often with unpredictable -- and frustrating -- results. Have we reached an impasse?